Please renew it! This is the only decent tv show with a brain. Is so intelligently written, captivating, and the acting is supreme. In the last episode, when fans literally got angry at Jimmy for being mean to Irene, that’s when you know how good the show is. People reacting emotionally to the show. Please continue it. !!!!! My hope is that tonight on Talking Saul, following the final show of this Season 3, they will announce that there will, in fact, be a Season 4. There has to be a Season 4!! And THEN there has to be a Season 5 that takes place AFTER Breaking Bad when Jimmy/Saul returns (somehow) to Albuquerque and becomes Mayor! Better not cancel Better Call Saul! Best show, but the beginning of season 3 was bettet than these last few, near the end. I also quite enjoy the show and hope it is renewed. Great post from Leo there. Each episode is like a Beethoven symphony or Mozart piano concerto – perfectly formed in structure and bursting with interesting content. 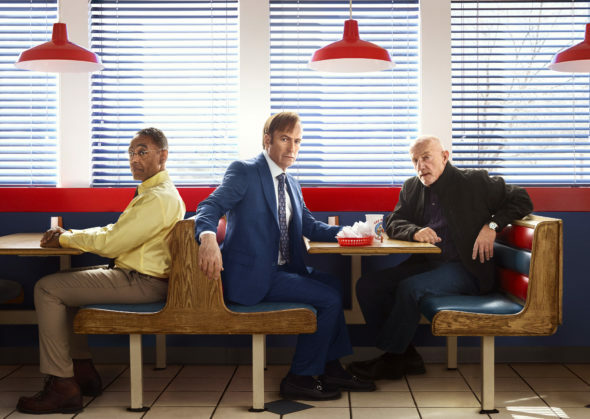 I don’t see how Talking Saul, which will follow the Season 3 finale, “live” next Monday, is going to work, unless it is going to be revealed on that show what the future holds. I want a celebration, not a wake! Greetings from England. Fingers crossed for lots more seasons ! I actually like it better than breaking bad !!! RENEW PLZ ! The show is slow as it is building a story. This is a great way to write a TV show as it builds curiosity and excitement for the next episodes to air. Please renew the show! I look forward to it every week!! This show is so boring if you were to put the relevant content together crom all seasons it would be a single season of a better than average show, at best. Please just have Walter White walk in and be done with this borefest! With the great success of Breaking Bad…can’t believe this series is struggling! It is an absolute gem in a TV-land of mind-numbing turds. Perhaps the connection to BB was not marketed strongly enough, would be a dreadful shame to terminate such a finely superior product. I don’t watch much t.v., but I do love this show. I watched all of Breaking Bad, and I actually like BCS much better. I’ll be bummed if they don’t have a season 4 and 5. Too many loose ends, and I’m totally in! Wanna see how this transformation to Saul Goodman happens. Great show!